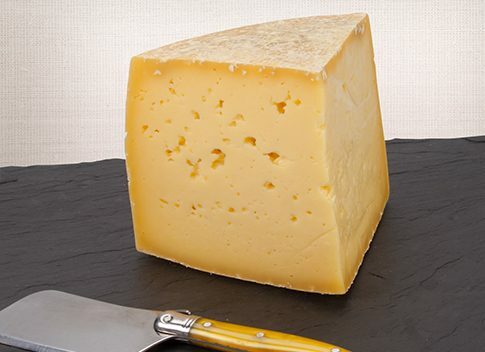 Tomme de Fayette, our version of a traditional tomme, is a grassy, complex cheese that is in a wheel weighing about eight pounds and is 8 inches across the top. The cheese is allowed to naturally age, with the rind going from slightly mold covered to speckled and semi-firm. Within, this cheese delivers fruity and grassy flavors, slightly citrus notes with a long finish. Being savory, Tomme de Fayette pairs well with meat as well as vegetables. This cheese brings a deliciously fatty yet dense composition to each bite and is a welcome addition to any cheese board. Priced at $23 for 1 lb, sold in 1/4 lb increments.